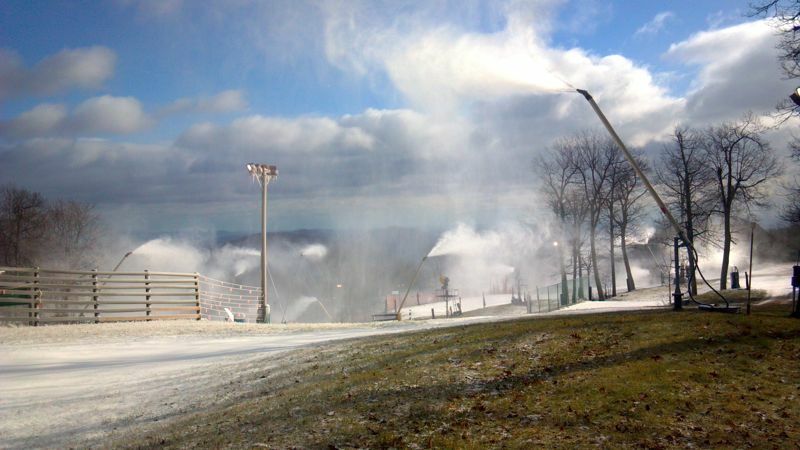 You are here: Home » News » Nelson: Temps Cooperating – Wintergreen Resort Making Snow! Blue Ride Life™2012 : Photo By BRL Mountain Photographer Paul Purpura : There have been several attempts recently to start putting down snow at Wintergreen Resort, but Friday morning heading into the pre-Christmas weekend the weather cooperated and continual snowmaking has started. Several attempts to put down snow at Wintergreen Resort few days haven’t worked out because of warm temperatures. That’s not the case now! After a strong cold front moved across Virginia early Friday morning, temps in the mountains dropped to the 20’s. Our BRL weather station (above) on Devils Knob at The Wintergreen Nature Foundation showed a temp of 25° around 10:30 Friday morning. Cold temps are expected over the next several days right into Christmas. There is a developing (significant) storm system that may also affect our area by Christmas night with the real possibility of wintry precipitation. Tommy’s keep an eye on this one as we get closer to Christmas Day. To get the latest updates on snowmaking at Wintergreen check out their blog over at The Mountain Message.